There are few things more worrisome to car owners than when that mysterious "check engine" light illuminates. It often forebodes an expensive visit to the auto mechanic's shop, where you are at his mercy to tell you what's wrong. 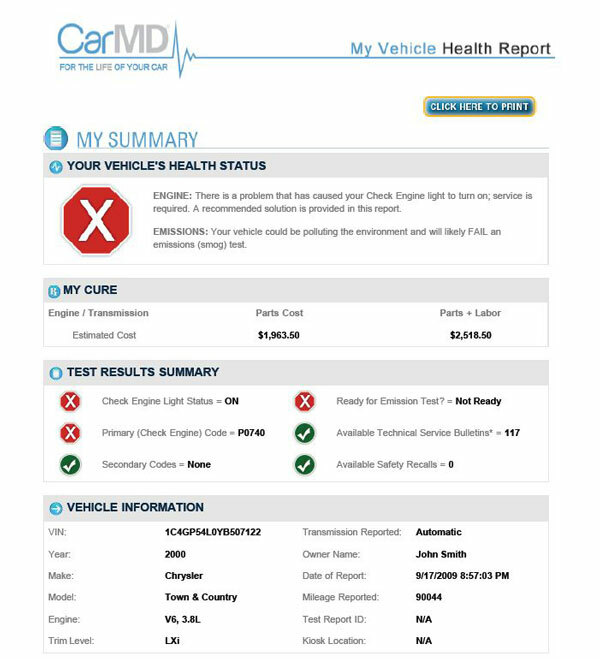 But a truly simple tool named CarMD ($99) can tell you exactly what's wrong in less than a minute and, with the help of a personalized Web site, even predict the price of fixing it. If a problem may be lurking but hasn't materialized yet, CarMD will diagnose that, too, allowing you to take action before you have a mechanical breakdown. And if nothing is wrong with your vehicle, it will tell you that, as well. This is all easily communicated with three LEDs––green for good to go, yellow for a warning and red if something needs urgent fixing––as well as an LCD screen that shows industry-standard diagnostic codes (understood by mechanics) representing the problems. 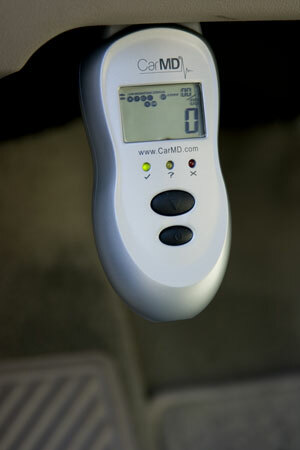 I recently tested CarMD with my ride, a 2006 Volvo S40, and found it surprisingly easy, even fun, to use. The process started with installation of software on my computer and a visit to CarMD.com, where I registered for a personal account and entered my car's brand and model name to find the location of its "OBD II" on-board diagnostics port. The CarMD plugs in to the OBD to download information about the car's functions from the vehicle's electronic monitoring systems, and every car made since 1996 has one of these ports (normally used by mechanics with their similar, professional-grade tools). In my Volvo, the port is readily accessible under the dashboard, to the left of the steering wheel, and I easily slipped the CarMD into it, immediately hearing the two beeps that confirmed a solid connection. Next, per the device's instruction manual, I turned the car key to the second position––illuminating all the lights and bringing all the dials to life in the instrument panel, but not actually starting the engine––and in less than a minute four more beeps indicated that the CarMD had finished its work. A quick glance revealed a green light, but I took the next step anyway: connecting the CarMD to my computer's USB port with the supplied cable. 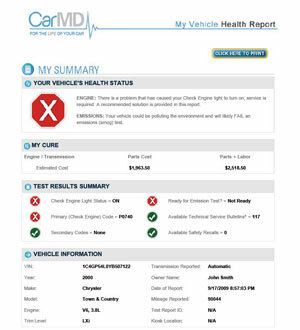 This automatically launched the companion software, which in turn opened CarMD.com in my Web browser, uploaded the data from the CarMD device to my personal account, and generated a report about my car that I could download and print. If I'd had diagnostic codes uncovered by the device, this is where I'd have found plain-English explanations of their meanings, as well as a clear explanation of the repair that would fix them, and the estimated cost of this repair––including parts and labor and the number of hours required. Common prices in my geographic area, based on my zip code, would be used for those estimates. The report also included information about past recalls affecting my vehicle, and revealed the existence of "technical service bulletins," or TSBs, that mechanics receive, advising them of fixes that can be made but which didn't warrant a recall. By upgrading to a premium CarMD.com membership, priced at $19.95 per year, I was able to download these four TSBs and found them to be insignificant. TSBs can also be purchased without a premium membership, for $1.99 each. Right now, CarMD reports cover only a vehicle's emissions systems––those triggering the check engine light––but the device is also able to read a vehicle's anti-lock brake system (ABS) and safety restraint system (SRS) diagnostic codes, and the reports will begin covering these, too, later this year. Besides using CarMD reactively after a warning light goes on, you may want to use it proactively to determine in advance whether your vehicle will pass its next state-mandated emissions inspection. It can also be invaluable for revealing problems with pre-owned vehicles you may be considering buying from a private seller (or from a dealer). @Ann Bryant - can you be more specific about what features you are concerned about with upgrading? Much of the information comes through the software and the website, so you should be able to get software updates without buying a new device. Can thid unit find what is wrong with the electical system , ignition, fuse box and tell what is broken what is not functioning and tell how to repair it:: Also can it be used on multple vehicles or just one registered vehicle. my remission light just came on and everyone is telling me I got hold of some bad gas.Could you tell me what is wrong? The check engine (or “emission”) light can mean any number of things, from a very minor, and temporary issue to a serious engine problem. In this day and age, it’s probably not due to “bad gas”. I would take your car to your dealer or a local mechanic to have them check the error code that is causing the light to go on. It’s a very simple procedure and they may even do it at no charge. Or get a CarMD and diagnose yourself, if you’re comfortable doing that. ABS codes Yes or No? I have read that the code reader does not read ABS and SRS codes. Then I read Car MD is working on it and at some point it will read ABS and SRS codes. Most recently the implication is that it reads the codes but Car MD reports has not started to cover any information about the codes. What is the status of ABS and SRS codes? Can anyone give a clear and simple report as of 2/5/2012. I hope you can assist. I have a 1997 Plymouth Voyager. This has a 3.0 engine with air, but the air is disconnected. I have taken this to mechanic after mechanic all I get is a bill. My problem no heat. When I start the vehicle and let it run, the heat gauge does go up. as soon as I hit the gas the heat gauge drops zero. As long as I drive the heat gauge does go up until stopping. even though the gauge shows heat there is none. I had the heater core originally flushed, the heater core changed twice, thermostats about five. I also changed the heat sending unit and the valve that connects the in coming and out going heater core at the firewall. I loose no antifreeze and have been told the head gasket is fine. I also had it checked for air bubbles, none. No matter what has been done, no heat. All I ever get is a bill for no repair. No one has a clue. I have spent 10 times what this is worth. Unfortunately, that’s outside our area of expertise. And it looks like even professional mechanics are perplexed. Unfortunate that you keep getting billed when they have been unable to resolve the problem. If you’re dead-set on getting it fixed, you may want to check Yelp or Angie’s list for a highly rated mechanic that won’t rip you off. Though, as you say, for a 1997 Voyager, you may be at the point where you just need to write it off and move on to another vehicle. I AM LOOKING FOR MY CART WITH CAR DR OR CARMD?